The Dig starts in the rain and wind. – Chatsworth Road Festival. The Dig starts in the rain and wind. Lifting the turf for the test pit at Brampton Primary School. 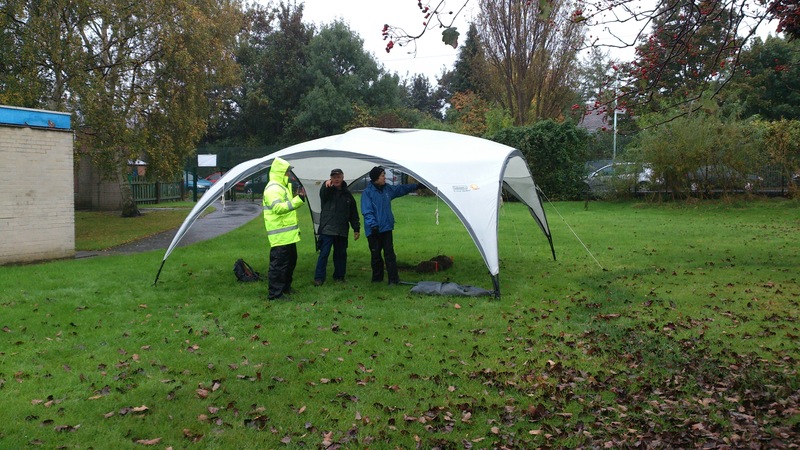 Our Community archaeology project started today in very wet weather. However, this didn’t put off our volunteers, the archaeologists and the children of Brampton Primary School. Headteacher Wayne Parkinson greeted the diggers and welcomed them to the school. Everyone was very pleased to see the gazebo which Transition Chesterfield had kindly lent to protect the test pit and our diggers. Tomorrow is another -hopefully drier- day at Brampton Primary School before we dig in some Chatsworth Road gardens. We still would welcome volunteers and everyone is welcome on Saturday to the Open Dig Day at Brampton Primary School on Saturday morning at 11am. This entry was posted in Brampton Primary School, C ommunity Archaeology Project, Matt Beresford Archaeology and tagged Brampton Primary school, Community Archaeology Project, Matt Beresford. Bookmark the permalink.